Matt Damon Is A Sniffing, Shouting Brett Kavanaugh On 'SNL' Season Premiere "I'm not backing down," says Matt Damon, in character as an angry Brett Kavanaugh during the Senate hearing over the sexual assault allegations. "I don't know the meaning of the word stop." 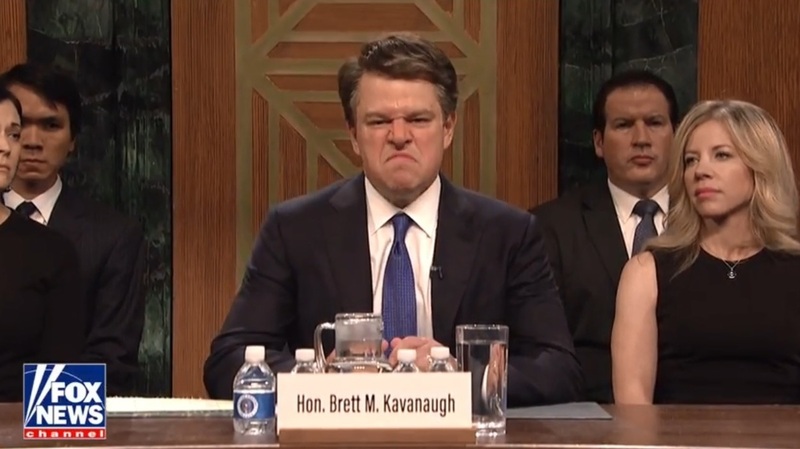 Matt Damon played Brett Kavanaugh on the 44th season opener of Saturday Night Live. Saturday Night Live kicked off its 44th season in a sketch many of us expected in some form or another: a send-up of the emotionally charged hearings into the sexual assault allegations against Supreme Court nominee Brett Kavanaugh. The show skipped any impression of accuser Christine Blasey Ford's testimony, starting the scene just before Kavanaugh's entrance. "We've heard from the alleged victim, but now it's time to hear from the hero, Judge Brett Kavanaugh," says Sen. Chuck Grassley, played by cast member Alex Moffat. In walks a shouting, sniffing Judge Brett Kavanaugh, in an appearance by Matt Damon. "I'm gonna start at an 11, I'ma take it to about a 15 real quick!" he yells. He talks a lot about beer. "I'm usually an optimist, I'm a keg is half-full kind of guy," he says. Echoing the real Kavanaugh's statement that "you'll never get me to quit," Damon's judge notes, "I'm not backing down ... I don't know the meaning of the word stop." Aidy Bryant played Rachel Mitchell, the Arizona prosecutor brought in to question Ford, who says, "I'm here mostly for Twitter." Later on in the scene, Kate McKinnon, who can do a good impression of pretty much anybody, channeled the indignation of Sen. Lindsey Graham, who lashed out on Thursday at Democrats. "You put this man on the Supreme Court now," McKinnon's Graham says. "No vote, no discussion. You give him a damn robe and you let him do whatever the hell he wants. Because this right now, this is my audition for Mr. Trump's Cabinet. And also for a regional production of The Crucible." Weekend Update had its usual digs at the week in politics, beginning with the Ford and Kavanaugh appearances. "A classic debate of she said, he yelled," as Colin Jost described it. Kate McKinnon was back (again!) as Justice Ruth Bader Ginsburg, giving her take on Kavanaugh and his calendars. Today on Ginsburg's agenda: "Don't die." Kanye West was the night's musical guest. He performed three times, the first of which was ... in a costume of a bottle of Perrier. He ended the show with a song performed while wearing a Make America Great Again hat. West is a noted fan of President Trump. On Sunday afternoon, President Trump tweeted about the first show of the season, saying, "Like many, I don't watch Saturday Night Live (even though I past hosted it) - no longer funny, no talent or charm. It is just a political ad for the Dems. Word is that Kanye West, who put on a MAGA hat after the show (despite being told "no"), was great. He's leading the charge!" The show is back live next week with host Awkwafina and musical guest Travis Scott.